Apple’s iOS 6 operating system has been available for just under two weeks and the uptake by users has been fairly rapid: after two days it was already loaded on a quarter of all iOS devices. But new data generated by Chitika Inisights on Tuesday shows that it’s not just iPhone owners that are upgrading, but iPad and iPod touch owners too. Below is a breakdown of the data, showing which group of device owners upgraded between the release of iOS 6 on Sept. 19 through Monday, Oct. 1. As the chart shows, about 60 percent of iPhone owners have already upgraded to or are using iOS 6. iPad owners were close behind, with about 45 percent upgrading in the first week and a half. iPod touch owners, meanwhile, were least likely of the group to upgrade right away, with just under 40 percent downloading and installing iOS 6. One major factor in iPod touch upgrades is compatibility: only the fourth- and fifth-generation models can run iOS 6. Chitika’s theory is that people are less likely to upgrade iPod hardware than iPhones and iPads because the former are not subsidized by carriers who offer discount incentives for upgrading. Still, even though iPod touch owners were the least likely to upgrade among iOS device owners, iOS 6 is already the most popular iOS version in use. Thirty-nine percent have moved on to iOS 6, while the next-most popular, iOS 5.1, comes in at 31 percent. This quick software transition is one of the most attractive features of iOS to app makers: rapid uptake of new operating systems means developers don’t have to spend as much time supporting older OSes. Instead they can focus on the latest software. As a comparison, Android 4.0 was released in October 2011, and as of Tuesday, about 25 percent of devices were using 4.0 or later versions of the software. This post was updated at 9:03 a.m. PT to include more recent Android upgrade data that was published today. I am pissed that google and apple have not considered the customer when they removed the YouTube app with the IOS 6 upgrade. 3/4 of the time I get an error that I cannot view the video on my freaking new IPad. Next tablet I buy will have to be thought through more thoroughly. I’m still on 5.1.1, iPad 2. I will not be updating anytime soon. I have always used YouTube safari, the default YouTube app is just way to freaking slow, my dsl connection can handle Netflix and other streaming, but the YouTube app forces hd streaming. The safari YouTube version now displays the “Sorry this video is not available on this device.” …I think this is a google/YouTube thing. Might be there way of fighting back… it’s really annoying, can’t even use YouTube, I think it’s time for YouTube to get a competitor. I wish I had not down loaded ISO6 on my iPad. Really miss the You Tube app. With history. Been trying to view videos on You Tube, they won’t open! Says “Sorry this video is not available on this device.” Want my old operating system back, or money back for iPad. NOT HAPPY! My sons one year old iPod can’t be updated because it has no memory left to download the software update. 8gb iPods are nearly useless now days. That’s why he’s getting a new one this year for his birthday. The rate of adoption and OS distribution charts make perfect sense. 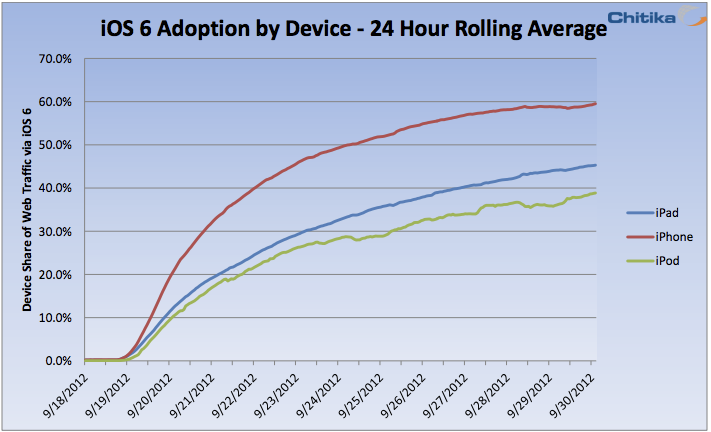 Many iPhones are replaced every 2 years so all but a few active users are iOS 6 compatible. The iPod touch, on the other hand, is generally kept in the family until it’s no longer useful to anyone. All non-current 8GB iPod touches are limited to iOS 4.2.1 at most. All iPads can run iOS 5 and the two most recent models can run 6. 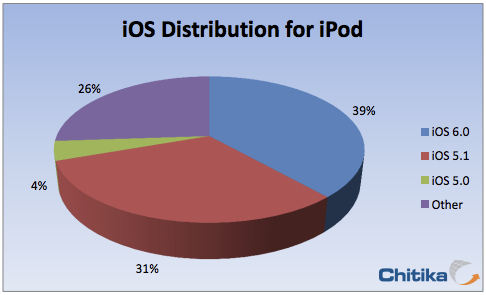 Most iPads will be kept until they break so the OS distribution for them will eventually look the similar to the iPod touch one: users spread across 3 different major OS versions. I don’t believe Frank’s assertion that most touches are jailbroken. They are a mass market device and the general public doesn’t know jailbreaking even exists. I think hardware does have something to do with it, but I bet the bigger reason is because most iPod Touch users Jailbreak their devices. There’s no big incentive to lose your jailbreak by upgrading to iOS 6 since there’s no untethered Jailbreak for it yet. That’s insane. Hardly any iPod touches are jailbroken.